One of my very favourite places, and evocative just by its name, Callanish really needs no introduction. 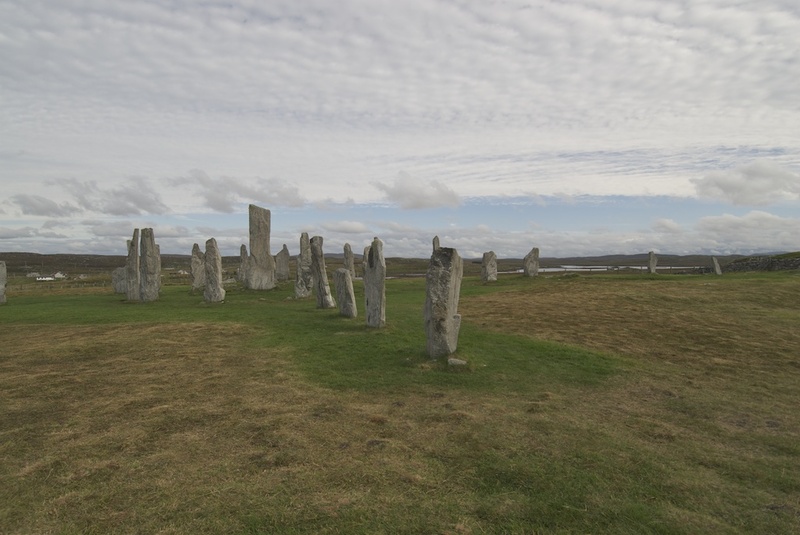 Situated on the west coast of the Isle of Lewis, at the very edge of the known world at the time of its conception, this is Britain’s most majestic and awe-inspiring stone circle. Even in bad weather, the long slender stones make an arresting sight as they dominate the horizon and draw the eye from all directions. Sunk into the peat of a remote, windswept hillside, they appear to be reaching upwards to the sky, like the remnants of some long-forgotten connector between heaven and earth. Callanish (also spelt Calanais) is thought to have been built between 2900 and 2600 BC, making it earlier in origin than the main circle of Stonehenge. At its heart is a burial chamber dating from a few generations later, in which human remains have been discovered. As you approach on one of the footpaths, you are struck afresh by the impressive size and scale of this site. Although it’s hard to tell from ground level, it forms the shape of a Celtic cross, with ‘arms’ radiating to the east, west and south. A long avenue of stones leads in from the north, and the ring of taller central stones is dominated by a single monolith 4.8 metres in height. Hewn from massive chunks of Lewisian gneiss, the stones are rough and very touchable, embedded with bands and folds of quartz and adorned with grey-green lichen. Weather-worn and cracked, they still have a presence that is not totally explicable by modern-day logic. According to Historic Scotland, in the late Neolithic period the climate of Scotland was much milder and warmer than it is today, and the sea level was lower. 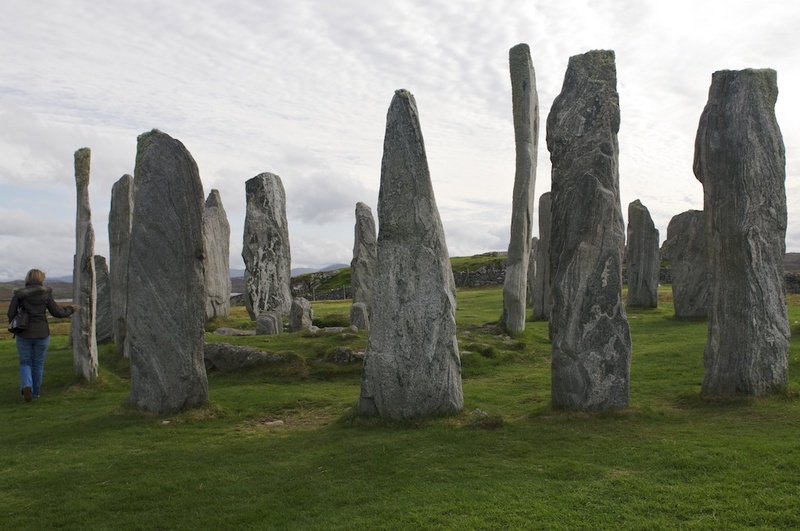 The people who built Callanish hunted salmon and deer, and probably kept sheep and cattle in the surrounding fields. But why was Callanish built in the first place? One legend says that the stones represent giants who refused to be converted to Christianity by St Kieran. 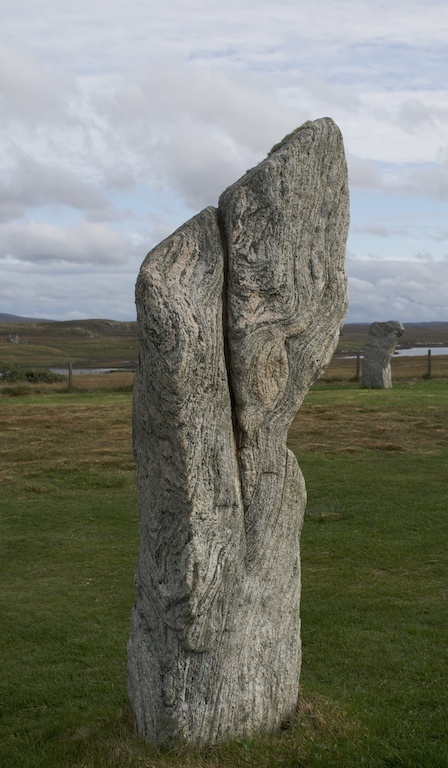 Many other stone circles throughout the British Isles have a similar story attached to them… mortals or other beings, punished for their wickedness by being turned to stone. Another, more interesting story, says that, at midsummer sunrise, a vision called ‘the shining one’ walks down the long avenue towards the circle, heralded by a cuckoo’s call. As you’d expect, this latter tale regularly inspires lots of visitors at midsummer, but ‘the shining one’ could just as easily be an interpretation of the sun itself. Whatever the reason for its erection, Callanish was abandoned about a thousand years after it was built. The climate had cooled in the succeeding centuries, and layers of peat formed, eventually engulfing the whole site to a depth of six feet. The stones were dug out again in 1857, when the Victorian era sparked a fresh interest in archaeology. Newly exposed, some of the stones suffered damage: fragments were deliberately or accidentally broken off, to be discovered later in boundary walls. According to Undiscovered Scotland, the tip of one stone was snapped off by a drunken traveller who was whiling away the time as he waited for a boat! It surprises some visitors to discover that there are more stone circles in addition to the main one. 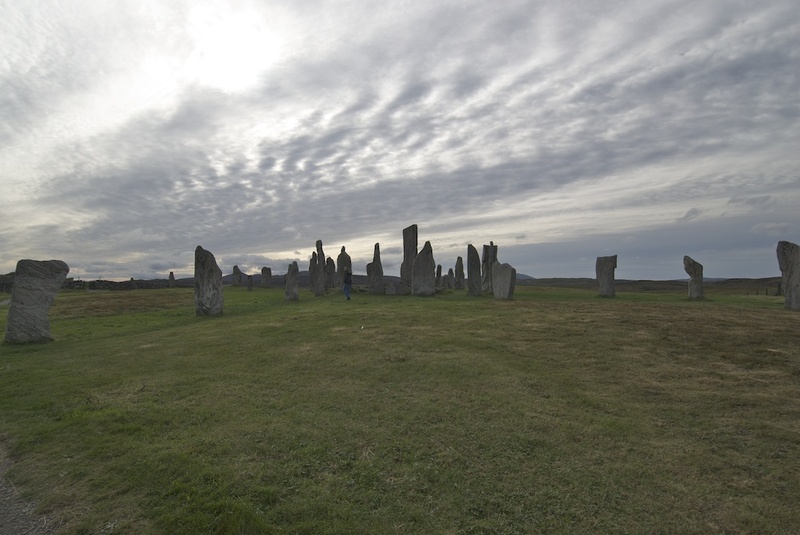 Callanish II comprises ten stones set in a circle 18 metres in diameter, and Callanish III (above) contains 20 stones in a double ring. Our visit to Callanish was on a cold day in September, under an unusual sky which made an almost surreal backdrop. There were only two other visitors. I remember being almost enchanted by the stones themselves, their age, their texture, their presence. 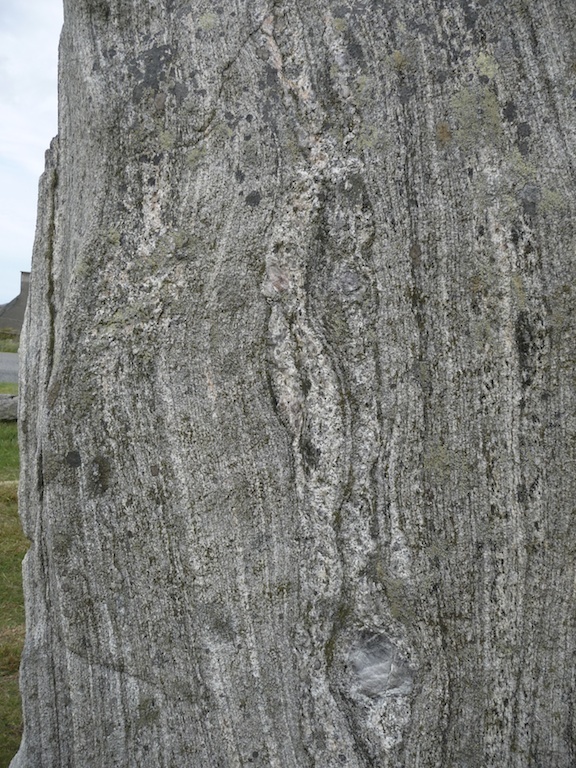 This is what I want to know: what have the stones of Callanish seen? What were the people like, how did they feel, what did they believe? I would love to have seen it when just completed, witnessed the celebration or ceremony, and heard the people’s voices. Callanish lies about 12 miles west of Stornoway on the Isle of Lewis. Full directions and a map can be found on the Historic Scotland website. There’s a visitor centre close to the main circle, with walk-through displays, a café and a well-stocked bookshop. Admission is free. To get to the Isle of Lewis, you can travel by CalMac ferry or by air from Glasgow (there’s a small airport at Stornoway). Are you drawn to the stones? And not far from Callanish is the fantastic Dun Carloway broch, a relic of a long-forgotten people. Awe-inspiring landscapes! Thank you for the knowledge shared! Definitely awe-inspiring – thanks for your comment! 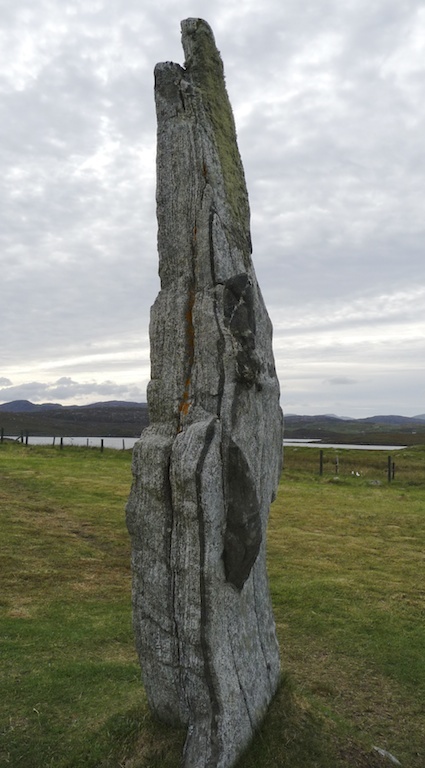 I enjoyed this article about the Callanish stone circle. Very intriguing and fascinating. Thanks, Jo. Thanks, Bob – yes, it’s an amazing place. Wow this is very interesting. I love learning about places like this from our past. Thanks for sharing!!! Thanks, David – glad you enjoyed it! Wow – I did not know about this place. Thanks for sharing! Really glad that you enjoyed it! Callanish is amazing. What a gorgeous place- and the sky was very cooperative, the clouds adding to the sense of mystery. It certainly is… hope we get some good weather this year, so we can explore some more. You are making me home sick. Yesterday I spent hours looking at photos from Iona…. Oh dear! I’m glad you enjoyed the feature, anyway! Thank you for re-blogging it, and for your comments. Hope you make it back to Scotland sometime soon! I love Scotland, I miss it so much. I will have to post up some of my Iona Photos. A very interesting read! There’s certainly some amazing places to go in Scotland, it’s lovely to hear more info on these kinds of things, it would be amazing to know what they were really thinking when they made these rings! Glad that you enjoyed it! I would like to know that, too. I’d say if you have the clout to put up eleventy-seven huge rocks in a pattern, you hardly need to be able to predict a moonrise every 20 years to get authority. I guess that’s true. They didn’t need planning permission, after all. Perhaps it was just the stage for some megalithic… rock concert? I can imagine the utility that a big communal focus and annual get together could have for a widely spaced community – they could see each other, trade goods, fall in love with girls from other villages…in effect avoiding the fracturing of the area’s culture into one village units. The making and carting of megaliths could be a way to boost the importance of the event and the site, and to burn off energy that might otherwise be spent on inter-village fights. Better to compete in dragging the annual rock more meters on your team’s shift than on who can burn the other’s town. and the coast around the stones. If you look at a map you will quickly see this.The tops of some stones are the shapes of mountain peaks in the distance.This is why stonehenge is flat topped with horizontal stones for the flat horizon of salisbury plain. That’s very interesting. I have heard a similar idea connected with other places too, including Castlerigg. Thank you for your comment! Fantastic. What a wonderful place, Jo. I visited Lewis in 1977 but never got the chance to visit Callanish. I’ve regretted it ever since. Thank you, Alen! 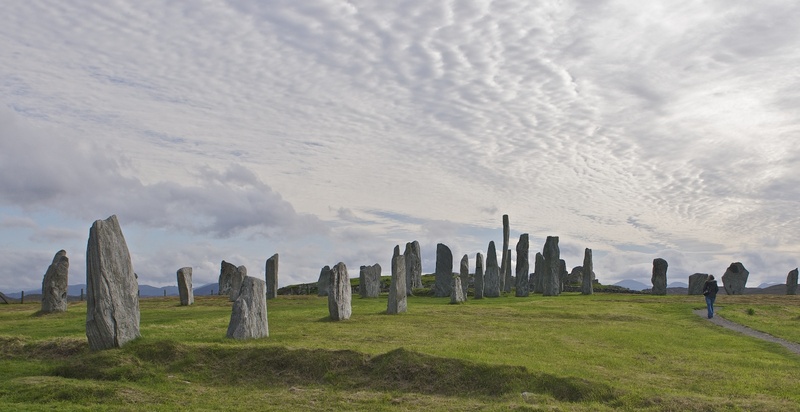 Aah, you would love Callanish. Nothing I have seen since comes close. There are flights to Stornoway from Glasgow! Just read your article on Callanish after visiting it somewhat by chance on my cycle of the outer Hebridees last year.. I definitely felt a sense of wisened peace and comfort from these grandparents .. I camped right next to the site, amazingly you can do that!, on the hillock there, with the stones standing clear through the subtle fence, reaching into the night sky, facing solidly all weather. I have never felt such a tangeable positive feeling from standing stine before. Your article has reminded me of all that and has kindled a new interest, the curiousity about our forefathers and foremothers. That’s wonderful Marsha! How amazing, to camp next to Callanish and see the stones reaching up into the night sky. I’m really glad you enjoyed my article. You do get a definite feeling from these places, and I guess everyone’s reaction is personal – sometimes it’s hard to put into words. Pondering about our forefathers and foremothers is the most fascinating thing, and I never get tired of it. Hope you continue to enjoy my posts. Best wishes, Jo PS if you’re on Facebook, take a look at the page ‘Callanish Digital Designs’ for some amazing photos of Callanish by a local photographer.